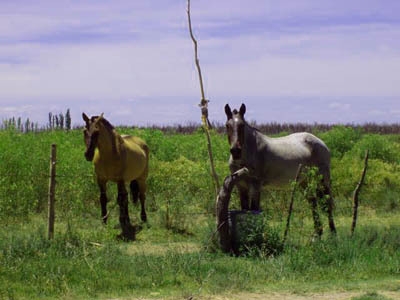 This finca near La Llave, located about 30 minutes from the city of San Rafael, has 5 acres planted in producing Common Grapes, a 10 acre Prune Plum Orchard, 7 acres of Alfalfa with 7 more acres fully cleared in anticipation of planting. 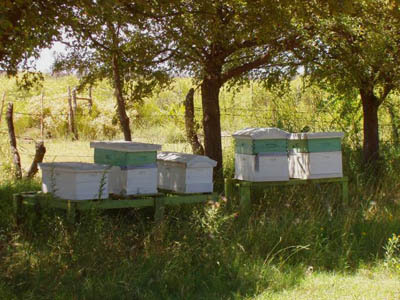 There are also 9 producing Bee Hives with all the equipment for maintaining and extracting the honey. The honey produces is very rich in taste and can add a bit to income. 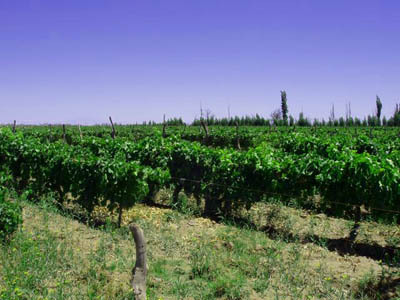 The vinyard is over 30 years old and this year produced a bit over 53,000 kilos of Common, Moscatel and Tinta Grapes for an income of 24,000 pesos or about US$8,000. The vineyard is missing vines which will be replanted this year from the cuttings made during pruning. 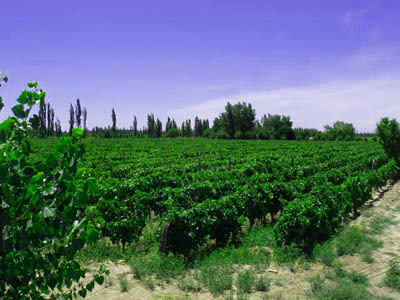 Once these replacements are mature the production of this vineyard should be about 80,000 kilos. The orchard is very young. This will be the fourth year of production and estimates are that production should be in the 70,000 kilo range. This will mean an income of about US$19,000. This was a Peach orchard in the past and was converted to Prune Plums. There are about 500 very old peach trees that have been removed under a government program at no charge. These are to be replaced with Plum trees this year. 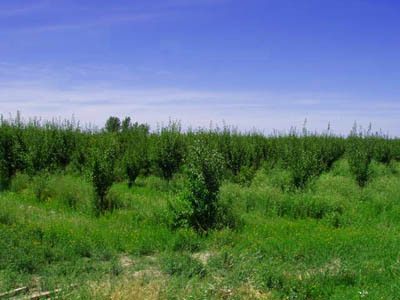 When this is done there will be approximately 3000 producing trees in this orchard. 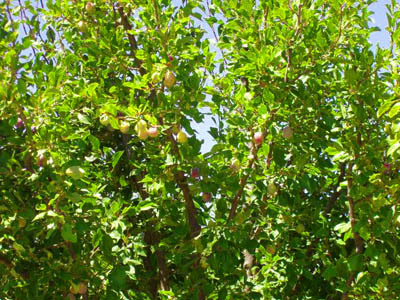 Estimates are that at full maturity each tree should produce between 40 and 50 kilos of plums. The Alfafa was planted in the Spring of 2004. 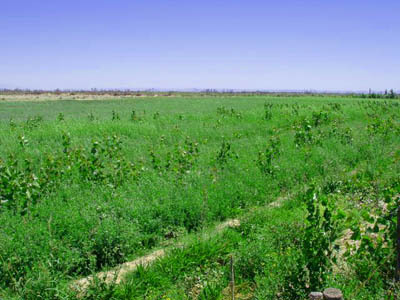 The Alfalfa planted is Monarco. 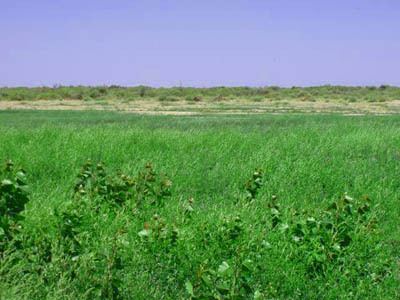 This is a type 8/9 Alfalfa and grows to a height of 24 to 30 inches before it is cut for hay. We only got one cutting of 189 bales of hay from it this year. The pictures show the Alamo problem we had. All of these have been fully removed. This next production year should see a minimum of three cuttings. Production should also be improved to the more normal 120 - 150 bales per hectare per cutting. Hay sells here for from 5 to 8 pesos a bale depending on the time of year and the amount of rainfall that the campo gets for cattle grazing. 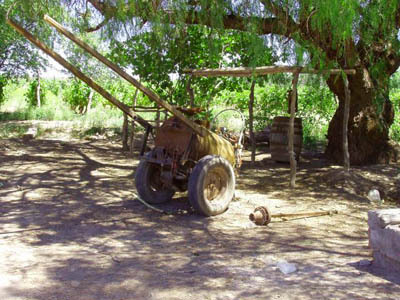 In 2004 200 Olive trees were also planted along the Alfalfa irrigation canals. Another 1000 Olive trees are on order for planting this year. The house is about 1000 square feet situated in 6 rooms. 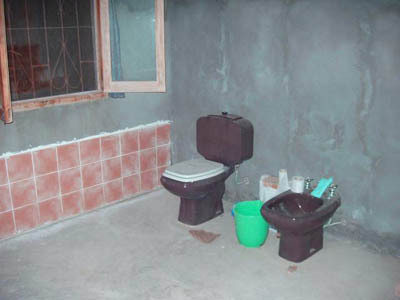 When i took it over it had no water system and no indoor bathroom. 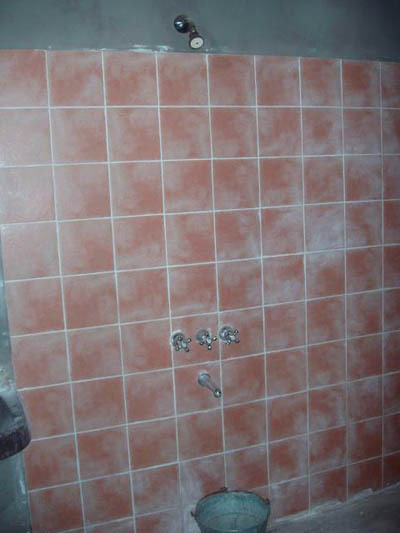 The people who owned it before did not have a well. 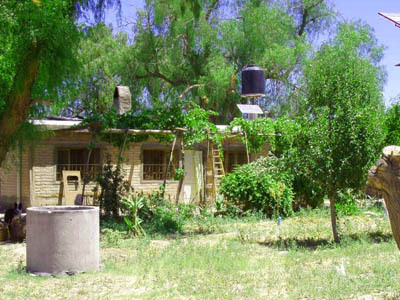 They used irrigation water and an outdoor bathroom for their needs. 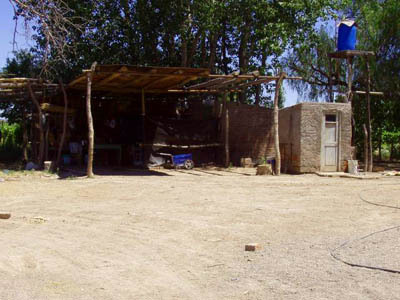 There is now a well that supplies water for household and animal use. The house has a 1000 liter above roof reservoir. The well water here is quite high in sodium and sulfates so i also installed a rainwater catch system with a 1000 liter reservoir for drinking water. The previous indoor dirt floored storage room for hams, chorizos and wine making was converted into a large modern indoor bathroom including clothes washer and spinner for drying clothes. 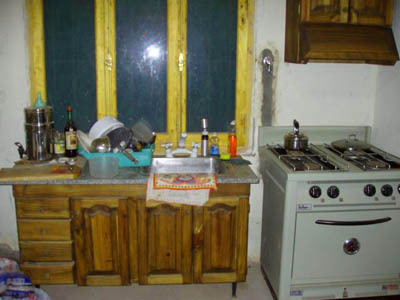 A modern kitchen was built and directv installed. Currently there is one solar panel to supply 12 volt electric lights at night. I have investigated putting in three-phase electric power, which the electric company has priced at US$5,000 to install. This is really the way to go, rather than solar, because it allows you to do so many other things.